Distribution: Native to the Pacific coastal drainages from northern Mexico to Alaska, rainbow trout have been introduced all over the world and now reside on every continent except Antarctica. Description: With a body shape typical of all trout, coloration is generally blue-green or yellow-green with a pink streak along their sides, white underbelly, and small black spots on their back and fins. Color patterns may differ greatly in relation to location, age, and spawning condition. Juvenile fish will have parr markings on both sides. Sea-run (anadromous) rainbow trout, known as steelhead, are silver in color and lack the distinctive pink streak along their sides. Habitat: Often found in small schools near cover such as vegetation, fallen trees, or boulders. In the spring they are found shallow and move to deep water in the summer to suspend and roam. Life history: Characteristics of rainbow trout are extremely variable. A single river system in British Columbia may contain year-round river residents, lake residents, and sea-run fish that migrate to the ocean and back at different times of year. Historically a spring spawner, rainbows seek out swift gravel areas to reproduce. The female excavates a gravel nest, called a redd, and covers the eggs once they have been fertilized. Males aggressively compete for position along the female as she lays eggs in multiple redds. 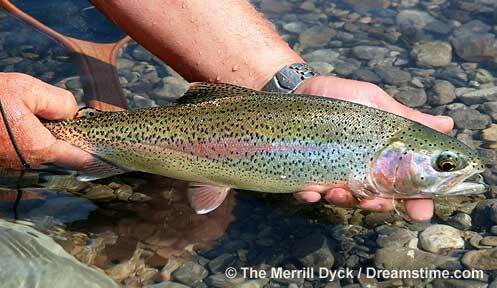 Rainbow trout are a typical salmonid predator and will take advantage of most food sources that they encounter. Aquatic and terrestrial insects provide much of their food as do other fish, crustaceans, and other organisms. They are a cold water fish species, intolerant of temperatures over 70F (21C). However, they are more tolerant of warmer water that the brook trout, which requires temperatures below 65F (19C). Most of New Hampshire's waters are too acidic to support natural rainbow trout reproduction, but there are a few locations where juvenile rainbows have been captured, including some of the tributaries of the Connecticut River in Pittsburg and Clarksville. Conservation/Management: Rainbow trout are managed to provide opportunity to NH anglers. With very little natural reproduction, hatchery fish are stocked annually in those waterbodies that support healthy fisheries. Continue to manage as a popular gamefish. Monitor catch rates, harvest rates, survival, and angling pressure in various waterbodies and adjust stocking rates accordingly.